As 2014 comes to end, most of us should know their ABC's of fall protection. Anchors, Body Harnesses, & Connectors, but what about the D? D is for Descent/Rescue & has become a top issue for not only OSHA & ANSI, but for construction workers and their employers. With many job sites always having A, B, & C taken care of, when a fall occurs & the worker's fall has been arrested, yet still suspended or dangling from his lanyard. The first issue to be concerned about is where all his blood will be flowing while suspended & we need to make sure this is handled to allow time for the worker to be rescued. We carry suspension trauma straps that are easily attached to your harness to place the legs in the proper position & some of the newer higher end harness like the Exofit Nex already have them built into the harness. 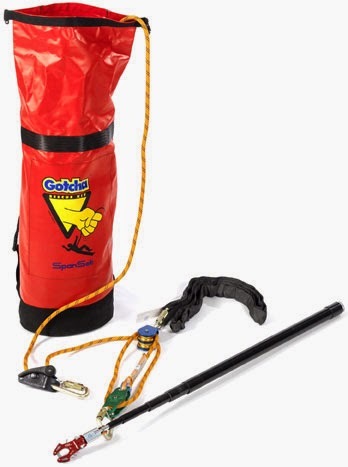 Many manufactures have various forms of rescue devices for assisted rescue, self rescue, & descent systems. You need to determine which type is best for your job application. Is the work environment safe for the worker to be lowered to the ground or will the worker have to be retrieved back up higher to a safe working platform or roof. Sometimes workers don't have coworkers around them, so one would need to have self rescue or escape device, which is usually a descent rescue. There will be instances where a worker is unconscious, you need to account for this & be ready for an assisted rescue. We carry rescue kits all configured with the components you need complete in a bag & ready to be in place, ready to use on your job. There are self retracting lifelines that have a rescue mode on them as well, these are widely used in the oil industry. Always make sure you have a rescue plan before you start your job. Don't forget the D in your ABC's & the R is silent, but with out it your fall protection system is not complete. In the event that you have to move heavier things they advantage you as well. Move substantial shakes or even tree limbs. The conceivable outcomes are inestimable with regards to winches. Utilize these for your ATV's and grounds upkeep and you will love it Best ATV winch. These tool will help from getting injured. I think one should work on the construction site if the employee is trained from fall protection training online.